What sets Digital Cinema apart from conventional digital video more than any other feature is its support for a broad, high quality spectrum of color. Getting the most out of your DCP requires some knowledge of color science in order to accurately translate your finished product to Digital Cinema’s target color gamut. 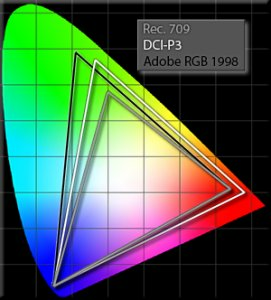 DCI-P3 is the accessible range of colors you can use in digital cinema as represented in RGB color space. We’ll get to that specifically, but the important thing to know is that Digital Cinema color space is more than likely not the color space that you have mastered your film in and we’ll need to apply some color science to get it where it needs to go. The first misconception about color grading is that it is not a setting in your software, but a function of your hardware calibration. Software can help you MANAGE the transition between color spaces, but it’s only as accurate as the equipment you’re using. For this reason, color grading should only be performed on professionally calibrated equipment. Grading your film any other way can result in your picture being translated and exhibited improperly. Ask you colorist for the full specifications of your grade or the target color gamut. We’ll dissect some color science terms and define them in relation to how they work with digital cinema. Target Color Gamut – A certain complete subset of colors with precise calibrations that allow color to be successfully reproduced in other settings or translated accurately for other gamuts and color spaces. The combination of a color model and color space provides your underlying image a precise mathematical definition of what colors can be addressed within it. CMYK (not used in video applications) – You may be familiar with this color model if you’ve ever printed an image. CMYK (Cyan, Magenta, Yellow, and Key/Black) values correspond to the primary colors found in printer ink. RGB – The simplest and most widely used color model is RGB, which encodes colors in discrete channels of red, green, and blue. This is because nearly every device in the world represents individual pixels as a combination of red, green, and blue values. YUV – A legacy color model for analogue video that encoded color as a function of luminance and two chrominance values. Distinguishable from RGB as it allowed for reduced information to be sent across the chrominance channels. YCbCr is YUV as expressed in digital applications. XYZ – The XYZ color model was aimed at bridging the divide between colors as objectively quantified on the electromagnetic color spectrum and those perceived by humans. XYZ values are analogous to the response in the three types of color receptors present in the human eye, but as a consequence of its encoding can address colors outside the scope of human vision (imaginary colors). As such, XYZ encoding requires translation to other color models for all practical uses. So, if your monitor is already built to display RGB images, why would you want to use any other color model? It’s all about the future! Take CMYK vs. RGB as an example. It is not possible for CMYK to encode pure red and so pure red is considered “out of gamut”. In order to express pure red as closely as possible, we need to approximate the values for red in CMYK, but also perform a lot of complex calculations to adjust how all other colors are represented in order to make sure my entirely color palette is accurate to the source. Digital Cinema uses XYZ’ as its target color gamut. XYZ is agnostic to translation to other color models because it is not tied to the limitations or conventions of any particular display technology. In fact, it can even address color outside the scope of human vision. In this way colors are addressed as accurately and efficiently as RGB, but unrestricted by current limitations on technology. Rec 709 – the color space standard for HD video and broadcast television. The vast majority of grades are performed in Rec 709 even if the film is destined for Digital Cinema. 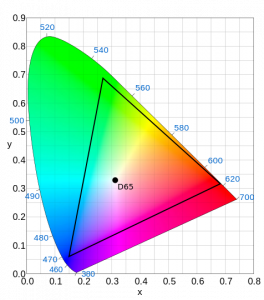 sRGB – the color space standard for computer monitors and devices. Uses the same color primaries as Rec 709, but with a specific gamma profile. Used mostly in animation. P3 – The color space for digital cinema. Features a wider range of colors than Rec 709, but is only used when grading a project for a DCP. P3 is commonly expressed with both a D65 and D63 (DCI) white point. Rec 2020 – A wide gamut color space encompassing approximately 75% of all visible colors. Intended for implementation in future UHDTV standards and HDR Cinema. Seen as a future end-to-end color space standard for digital cinema and consumer applications alike. Gamma Offset – In order to most effectively compress and deliver digital video, it is useful to use a gamma offset to limit the number of colors addressed by the compression engine. This is a vital detail to find out from your colorist! 2.2 gamma – Most common gamma offset, used in Rec709 and sRGB color profiles. 2.35 gamma – The technical EBU standard for Rec709 profile, but not as widely used as 2.2 or 2.4 gamma. 2.4 gamma – Used by many colorists when grading Rec709 projects to compensate for the higher contrast of modern displays. 2.6 gamma – The standard gamma for P3, P7, and Rec2020 profiles. White Point – White point is a calibration value used for determining the “color temperature” of an image. Just as with cameras and film, this value is measured in degrees kelvin. D65 (6500K) – Used in Rec 709 and most other color spaces. DCI White (6300K) – Used specifically in DCI P3 target color gamut. Chroma Bit-Depth – Bit depth is the measure of resolution within a pixel. That is to say, how many discrete colors can a pixel address. In video we measure this a function of bits per channel (bpc). The greater the bit-depth, the more colors are available to record. When an image tries to encode color data that sits outside the bit depth of the image, we perceive banding. This artifact is most evident in images featuring pronounced gradients like sunsets. Digital cinema supports full 12-bit color, which effectively eliminates any perception of banding and allows for explicitly wider color gamuts like P3. Legal/Full Range – Legal range video is a technique used in broadcast to limit the information addressed by an encoder on the luminance channel. If we think of our luminance channel having values from 0-100, legal range squeezes that video to an effective 7.5-92.5. The purpose of this is to ensure no data is lost in transfer. As you may have experienced yourself when encoding video, codecs tend to eliminate detail in the extremities or at the very least introduce artifacting. By delivering content in legal range and expanding it during playback or exhibition, these effects can be minimized.